Windows Photo viewer is an old software that is still available in Windows 10. It can preview BMP, DIB, GIF, JFIF, JPE, JPEG, JPG, JXR, PNG, TIF and TIFF files. In My Computer, Windows Explorer or File Explorer, locate the image you are trying to open. Right-click the image. On the context menu, click Open With -> Choose another App. 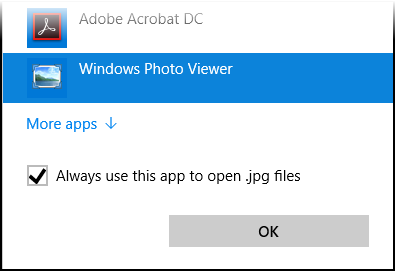 Select Windows Photo Viewer in the list. Check "Always use this app to open .jpg files". 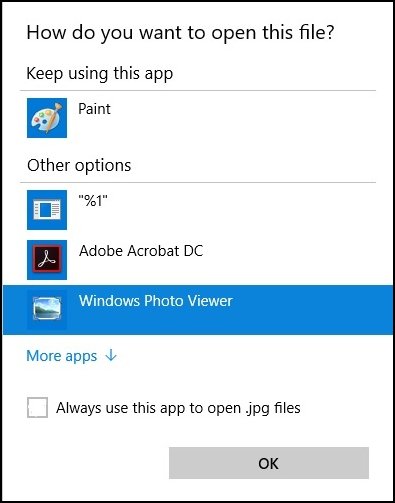 The Windows Photo Viewer is set to be the default app for the type of file.